""During Apple's iOS 6 release 33% of our traffic was going to apple.com, but 75% of that was being served from cache!"" Eli Vaughan, Networks Administrator, Medicine Park, USA "CACHEBOX is doing great by saving bandwidth and pre-caching..."
Firas F. AL-Saidi, IT Director, Al-Bayan Bilingual School Kuwait "With DNSBOX, our previous IP conflict problems are non-existent." Mike Neverdusky, CDE Lightband, USA "Even un-cacheable content can be accessed faster due to the bandwidth saved by serving part of our traffic from CACHEBOX." Jon van der Raadt, Connect Charter School (Calgary Science School), Canada "Without CACHEBOX we would have died on the vine; we now save between 47 to 68% of our bandwidth and have seen speed increases up to 150%!" In mid 2010, one of the world’s largest telecommunications equipment manufacturers purchased a competitor’s cellular infrastructure business. As a result of the acquisition, a new network division was set up as a ‘laboratory environment’ under the acquirer’s R&D infrastructure. This was a greenfield project whereby the cellular infrastructure divisions of both companies were being merged. The inherited network had a “flat” structure – meaning that labs and office IT were combined, with DNS and IPAM handled by the IT group. However, our customer’s policy was to keep networks entirely separated for different kinds of operations such as “Office IT”, “Data Centre” or “R&D”. So the new division’s network had to be isolated from the core office network, with DNS and IPAM done internally at the laboratory and the IT department being blocked by a firewall. The project therefore required integrating and migrating DNS and NIS (Network Information System) data from the acquired business in compliance with our customer’s model, and creating a standardised environment for DNS and IPAM. The new setup brought about some challenging network requirements. The main issue was that of migrating DNS and IPAM data: previously, DNS and NIS (Network Information System) were done on a Solaris system. 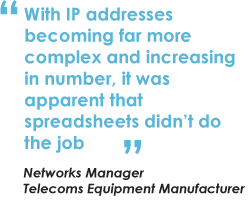 A spreadsheet was used for IP address planning. For the new project, our customer wanted to preserve all the meta-data from the inherited network’s NIS and spreadsheets and migrate it to IPAM. IPAM would be critical in handling various functions like block allocation and keeping track of IP addresses. The project had an IPAM requirement of around 16,000 IP addresses in total, spread over /21 and /24 size subnets. “We did an analysis looking at different variables: How many DNS entries are we going to move? How long will migration take with an appliance versus a spreadsheet? How much risk would each entail? What are the differences with using a turnkey solution? What are the savings we would achieve with an appliance-type solution, and so on,” said the network manager. “After some deliberation we concluded that we’d save thousands of Euros a year with an appliance approach. It would also mean getting rid of interdependencies between departments, which could cause delays or create difficulties with decision making,” he continued. The network manager searched online and found that the DNSBOX solution made sense for the project’s unique requirements, considering both cost and the technical expertise of our engineering team. He therefore decided to deploy a DNSBOX400/200 master-slave solution. 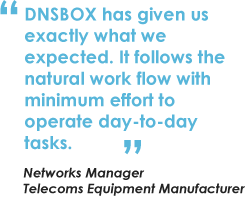 “DNSBOX was easy to deploy – it didn’t require much training to get started. The ApplianSys support engineers guiding us understood our technical requirements well – we were assured that we were in good hands,” he commented. Our customer now has a single integrated shared system, with visibility and control of DNS and IPAM data, thanks to its DNSBOX solution. Delegated administration can be implemented in a controlled and secure way. The solution combines IP address space planning and controlling actual usage in a coherent system where the planned and actual data are kept in sync. It also allows them to manage multiple, distributed DNS servers anywhere in the world on a centralised system. “DNSBOX has given us exactly what we expected. It follows the natural work flow with minimum effort to operate day-to-day tasks. The integration of DNS and IPAM means saving time, giving us the ability to delegate DNS administration and reduce dependency on skilled employees. Now, administration can easily be passed on through business generations without worrying about maintaining lots of specialist local knowledge and the risk of losing it,” comments the Network Manager.